Ships from and sold by Sketcher1982. Comment: CD with original artwork. Disc is in excellent shape! Free upgrade to first-class shipping with delivery confirmation! Immediate shipping! 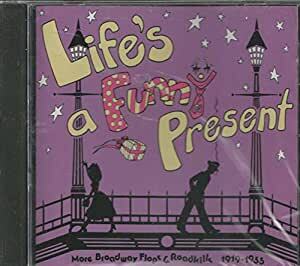 Until I can prepare a full review for this CD, please reference the review for YOU CAN'T PUT KETCHUP ON THE MOON: MORE BROADWAY FLOPS & ROADKILLS 1925-1955, the predecessor to this recording. The review mentions the cast and contents of LIFE'S A FUNNY PRESENT, as well as the series of which it is a part.